Thinking of joining van life and living in a campervan? 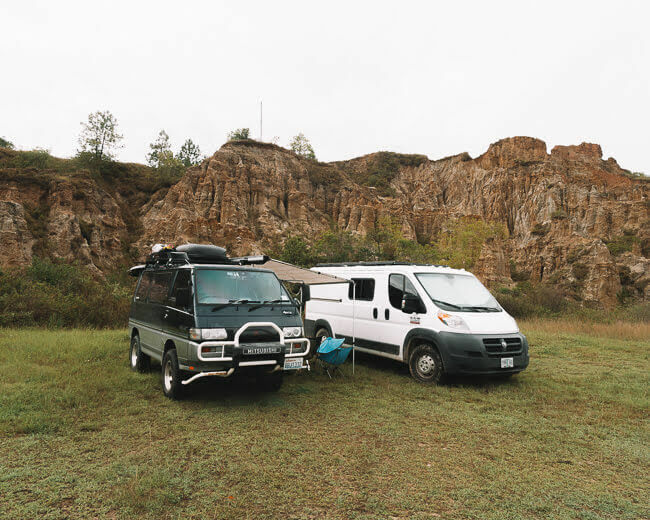 We spent 2 years traveling in our van across two continents and learned so much along the way. Here are 50 useful tips that every new van lifer should know. Picking the right campervan is one of the toughest choices when you’re new to van life. 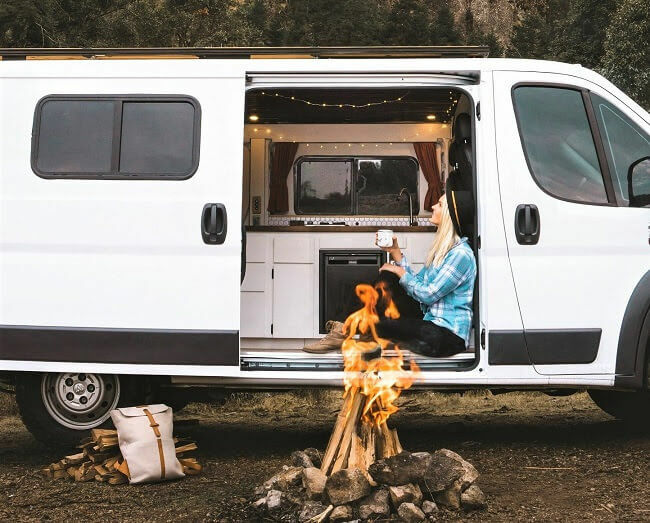 From our personal experiences and struggles of living in a van full time, here are some tips to help you decide what type of van you should choose. 1. Getting a 4WD vs 2WD. If you live in an area with seasonal changes and snow, an AWD or 4WD is highly recommended. 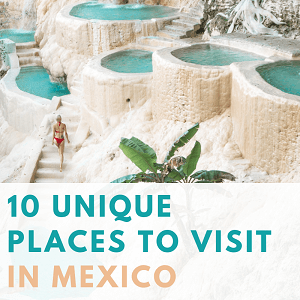 If you plan to travel only during warm seasons or to countries like Mexico that don’t go through seasonal changes, a 2WD is perfectly capable of handling those types of road conditions. 2. High top vs low top. While having a high top is nice for standing up, a high top van is more likely to hit trees and not fit into parking structures. Besides cooking, you normally don’t spend that much time standing up in a van so a low top van is better if you plan to travel around a lot. 3. Old van vs new van. Don’t get an old van unless you don’t plan to drive that much. Old vans come with tons of issues and there is nothing more frustrating than getting stuck in a foreign place with no replacement parts. 4. Sprinters vans vs Dodge Promaster vans. Sprinter vans are super popular right now and run great when they are new but as they get older, they start getting tons of issues. Our first van was an older Sprinter model and it was having lots of problems right off the bat. After having it in a shop for 6 months we sold it and got a newer Dodge Promaster van for the same price. Promaster vans are not as “cute” on the outside but on the inside, they are super spacious and generally have less mechanical issues than older Sprinter vans. If you want to learn how we converted our Promaster van into a full-time camper van for less than 3K, read more here. 5. Buy a van with windows (or install them). Windows will make you feel less claustrophobic and look less creepy for stealth camping than a windowless looking work van. When it comes to small spaces, comfort is everything. These are some must-have items to comfortably live and travel in your campervan. 6. Bed vs couch. When it comes to building a bed, one of the biggest choices is whether it should be a foldout couch or a permanent bed. In our case, we chose to go for a stationary bed because we didn’t want to deal with making a foldout bed every morning and night. Some of our friends have foldout beds and they are perfectly happy with their choice although it does take extra time to make it every day. 7. Install a fan. Having a good fan like this MaxxAir RV fan is a must especially in summer time. Vans get pretty stuffy unless you have a fan that can circulate the air inside. 8. Hook up a fridge. 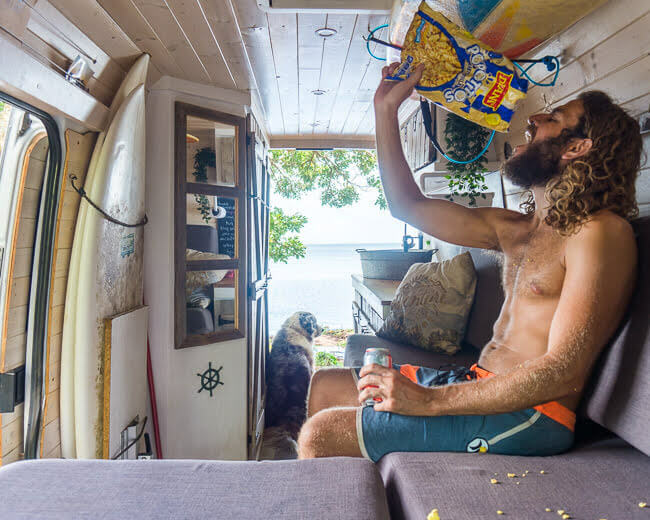 Most full-time van lifers have a built-in fridge in their campervan like this Dometic one. A chest style fridge like this one is also a common choice. 9. Get a stovetop. Having a permanent stovetop like this one is one of my favorite parts of our van. We have traveled in vans with removable stove tops before and they work great, but it does add an extra 10 minutes of set up and break down with every meal. And since we’re all about making things as easy as possible every day for us, we chose to go with a permanent stove top with our conversion. 10. Hook up a sink. 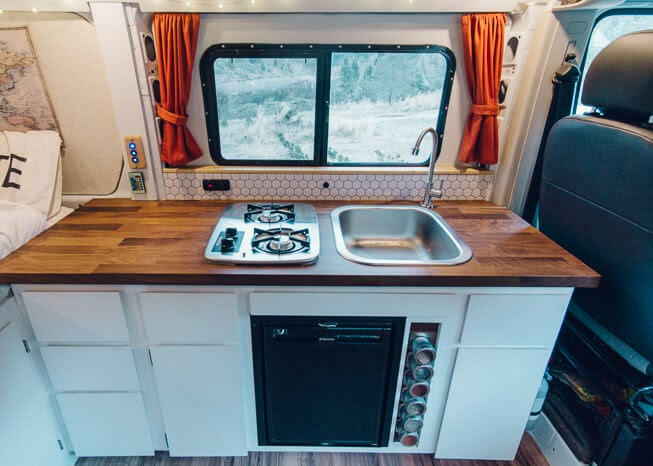 Having a sink with running water is the perfect addition to have a complete campervan kitchen. In our kitchen, we hooked up this 7-gallon water storage jug and this faucet to a basic sink that we got at Ikea. It’s enough water to wash dishes and produce for a few days to a week without refilling the sink water. 11. Get deep-cycle batteries. If you plan to travel long distances, having one or two deep cycle batteries is a must because all of the amenities mentioned above draw a ton of power. Trojan is a well known and respected brand that sells deep cycle batteries that you can’t go wrong with. Before you start packing your van, here are a few tips to keep in mind as you prep for life on the road. 12. Keep it to a minimum. When the time comes to start packing your van, only bring the minimal basics with you. We have been living in our van for a year now and we have been perfectly fine with 1 set of silverware each, 1 cup, 1 plate, etc. It’s so easy to overpack your van but the more stuff you bring, the harder it will be to find anything at all in your van. 13. Bring the right weather clothing. Before we left for our journey through Central America I didn’t do much research on the weather and I ended up bringing the wrong type of clothing. I told myself that I would just buy whatever I needed on the road but oh man I was wrong! Finding clothing that fits well, looks good and is made of decent materials in a foreign country is like mission impossible. When it comes to clothing, just buy whatever you will need before leaving, it’s just so much easier! Things will go wrong on the road, it’s just an unavoidable fact. Here are a few essentials things to keep in your campervan for emergency situations. 14. Bring along basic tools. This year alone we crushed our exhaust crossing a river, changed out numerous small parts, and rebuilt our solar panels in a mall parking lot. A toolbox like this Stanley one comes with most of the essentials needed to repair things on the road. Along with a toolbox make sure to bring along a headlamp, duct tape, spare electrical connectors, wire strippers, and fuses. 15. Emergency Items. Beyond the practical needs of keeping an emergency kit in a van, some countries require it by law and will ticket you if you don’t have the required emergency items like a fire extinguisher and an emergency kit in your van. To check requirement for each country, go to the WikiOverland Page, select the country you’re traveling to and scroll down to the section named “Mandatory Items In Vehicle”. This will list any emergency items you are required to keep in your van by law. Finding a free or cheap place to sleep is one of the biggest daily challenges traveling in a van. 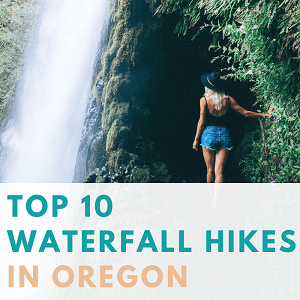 If you find yourself at night time with no place to camp, these are some of our go-to places and tips to find a free spot to sleep at night. 16. Get the iOverlander app. iOverlander app is our number one tool that we use to find camping spots on the go. All of the camping spots in this app are added by other overlanders along with detailed reviews on cost and experiences. The camp spots in this app range from free camp spots to super nice “$20 bucks a night” spots with electricity hookups, WIFI, and showers. 17. 24-hour stores like Walmarts. Oh how much I have grown to appreciate Walmart stores as a full-time van lifer! Before I started traveling, I would avoid going to a Walmart at all cost but now seeing one on the road brings me tears of joy. Not only you can restock everything you need at a Walmart, but you can also often sleep in their parking lots. It’s not a glamorous camp spot, but nothing that a bottle of wine can’t fix (which you can also get at Walmart)! 18. Rest stops and truck stops. During our travels around the US, we slept most of the nights in free rest stops or truck stops. But while some are well taken and clean, some can be a bit run down. As a female, I would always use rest stop bathrooms with caution and often would have my husband accompany me and wait outside while I use the restroom and shower. 19. Gas stations. In towns without any camp spots or 24-hour stores, we usually resort to sleeping at a gas station. Out of respect we first fill up on gas and always ask the attendant on duty. In 9/10 times they are usually ok with us sleeping there. Don’t slip into bad habits on the road by following these van life tips to stay healthy. 20. Have a basic kitchen set up. Building a kitchen in your campervan will help you keep better habits by cooking healthier meals. 21. Skip the fast food. Although fast food is usually the faster and more tempting choice, it’s easy to go down that rabbit hole and hard to bounce back. Keep up healthy eating habits by doing frequent grocery shopping and making your own meals. 22. Workout frequently. Finding a gym on the go is one of the hardest parts of van life. Although there are gyms that offer day passes, not every gym offers one and they can cost anywhere from $5 to $15 for a day use. Balance gym day passes with frequent outdoors workouts like running, hiking, squats, lunges, sit-ups, pushups and taking stairs. Resistance bands can also be a great addition to your workout and don’t take much space in the van. One of the most frequently asked questions we get is “How do you take a shower and stay clean in a van?”. 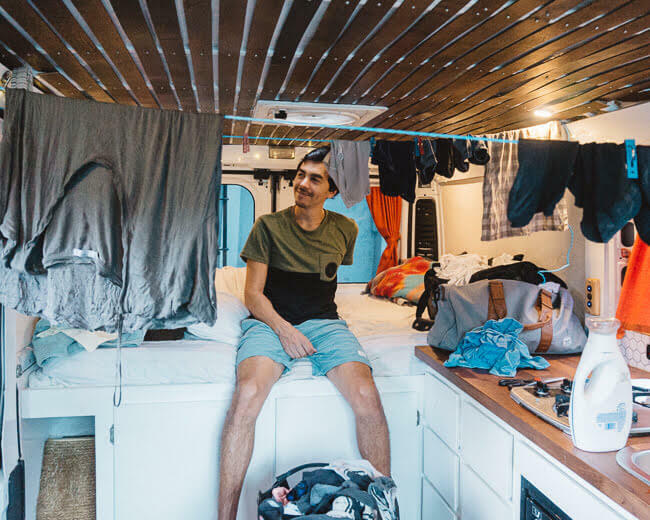 These are our tips to staying up with personal cleanliness by living in a van without a shower. 23. Get a solar shower. There is nothing worse than going to bed dirty from a few days or camping or hiking. Most campsites don’t come with showers but you can either get this camping solar shower bag or make your own solar shower from a PVC pipe from Home Depot. 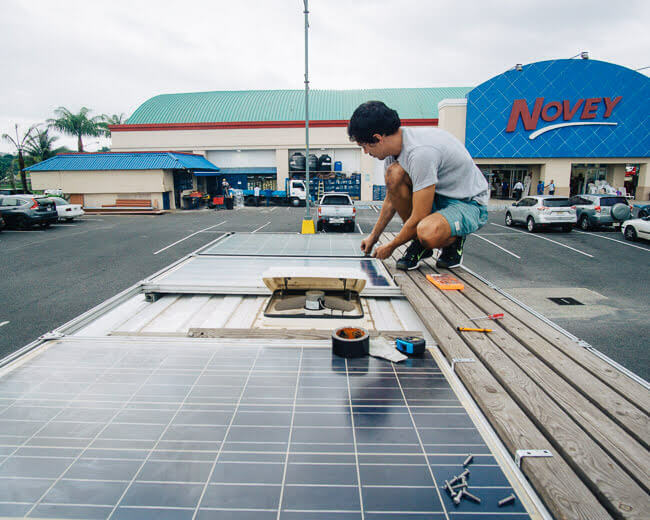 If you want to read more on how we created a PVC pipe solar shower for our Honda Element SUV conversion, click here to read the post. 24. Keep a set of wet wipes. Wet wipes are a live saver when a solar shower is not an option like in cities. We always keep a set of wet wipes in the van for emergencies. 25. Keep up with your laundry. It’s so easy to put off doing laundry on the road but before you know it you’ll have crossed 5 countries wearing the same dirty shorts until you find yourself doing your laundry in a bucket at a gas station. Learn from us and do your laundry periodically before that monster gets out of hand. As a woman, you’ll be faced with additional hygiene challenges when living in a van full time. Here are a few helpful tips to make things a bit easier on the road. 26. Get a GoGirl or pStyle. I didn’t know that these feminine products existed until I started traveling full time and I found out that just about every female traveling in a van has one. I immediately ordered a GoGirl and it’s been a lifesaver. It basically lets you pee standing up (like a guy) so you can go to the restroom outdoors more discreetly. 27. Doggie bags. Little doggie bags are great for disposing of feminine products in a van. Keep your things in order with these tips to help you stay organized in your campervan. 28. Get clear storage bins. Storage bins are the best to keep things organized in a van. I use a variety of bin sizes from extra-large for my winter clothes to smaller ones for toiletries and electronics to keep things separated. I especially love the clear storage bins because they let you see exactly what’s in each bin without taking everything out. 29. Use over the door organizers. In addition to plastic bins, we use a few over the door organizers for smaller things. We attached them on the inside of our main storage doors to hide them out of sight. 30. Divide and conquer. If you are traveling with a partner, split up your daily tasks to be more efficient and get them done faster. 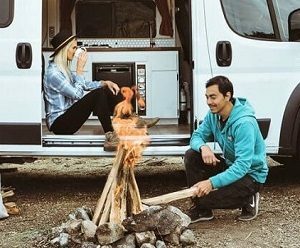 Stay on track in van life by keeping a routine with these tips. 31. Set your alarm. Living in a van full time it’s so easy to let things go. Before you know it you’ll be waking up at 10 am and wasting a whole day doing nothing (you’re not alone, we’ve all been there…). Instead, treat van life like you would a job. 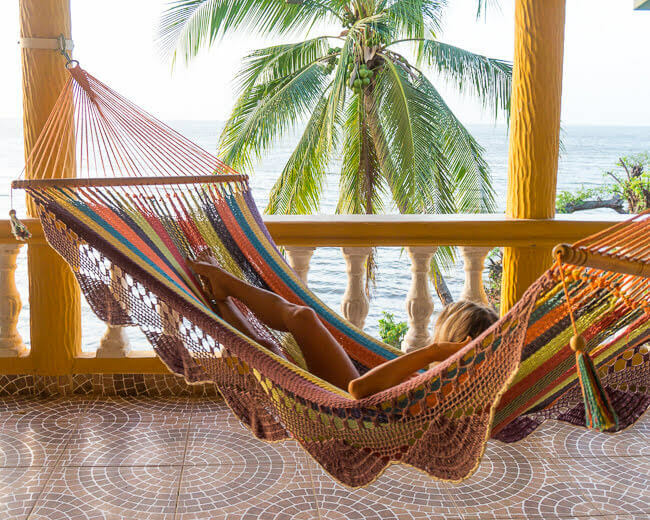 Set your alarm, get your chores done and then you can enjoy the rest of your day. 32. Clean your dishes and sweep. 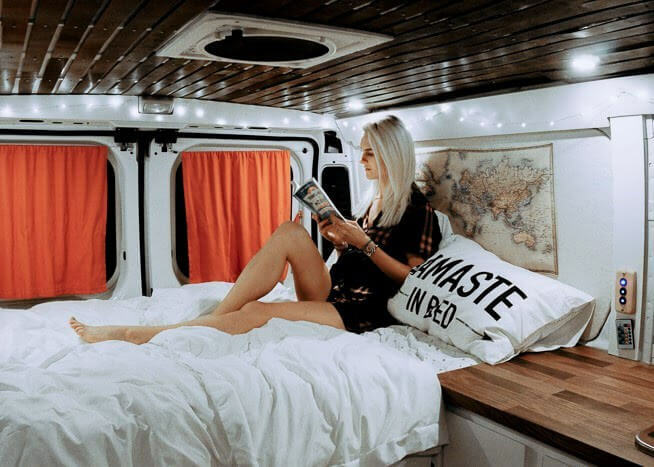 Your van is your home and you’ll be spending the majority of your time in it so you’ll want to take care of it. We always do our dishes and sweep the floors with our mini brush after every meal to keep a routine and to keep things tidy. 33. Make your bed. It’s the little things like making your bed every day that make your van feel like a home. 34. Set realistic goals for the day. Every morning I write down a few goals for the day whether it’s getting certain things done for my blog, doing chores or planning a driving route for the week. Unlike a job where your boss might give you tasks to complete, in van life you’re on your own. Writing down a daily to-do list helps me keep myself in check and to stay on track with my goals. Worried about being able to keep up with your job on the road? 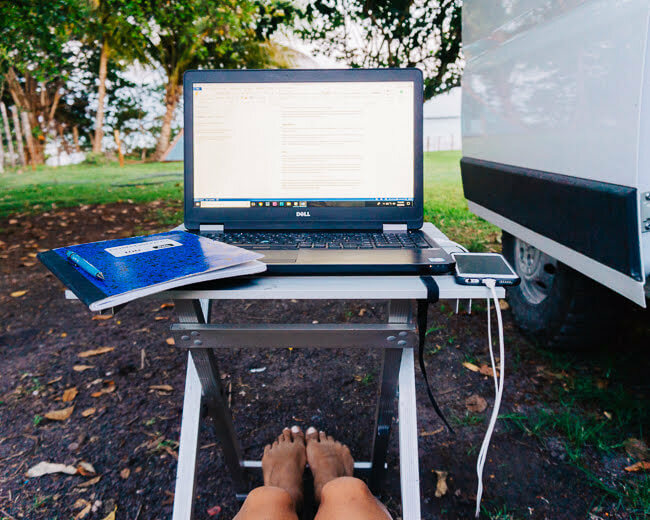 Check out these great tips on how to get your work done while traveling full time in a campervan. 35. Get Project FI service for your cell phone. I have been using Google’s Project FI service for a few years now and I love it for traveling because it lets me connect to the local service as soon as I enter the country. I have traveled to 16 countries using this service without buying a single phone chip card. Check the WiFi speed online. We use a website called Fast.com. Check the walls for plugins to charge your laptop. Yes, some coffee shops will seal them off to save electricity and to prevent people from sticking around. 37. Invest in a WiFi antenna booster. WiFi enhancers are great for picking up and enhancing close by WiFi signals. We use this TP-Link Archer antenna to boost our signal when working or watching Netflix in our van. We also recently discovered WiFi Map App that is a phone app listing all nearby open WiFi hotspots. We started using Wifi Map in a combination with our WiFi antenna booster to connect to open WiFi networks from our van. All the WiFi networks in this app are updated by other users but for the most part, it’s pretty up to date. All those long drives can sometimes get a bit dull. Here are a few tips on how to keep yourself entertained while living and traveling in a van. 38. Download podcasts and audiobooks. You’ll be spending a lot of time driving so having a library of downloaded podcasts and audiobooks is a must. My favorite podcast is “Planet Money” by NPR with entertaining episodes on weird and quirky things in our economy. 39. Kindle vs real books. When I first started traveling in my van I would haul around a set of hardcover books. I just love holding a real book in my hands but I quickly realized that they take up too much precious space. Instead, I got myself a Kindle because a Kindle takes almost no space and with Overdrive app you can borrow and read books from your local library for free. It’s been a total entertainment game changer for me on the road. 40. Download Netflix movies and shows. If you have a Netflix account, you’ll be happy to know that you don’t have to cancel your membership while you travel in your van. With Netflix, you can download movies and shows onto your phone, tablet or Windows laptop through the Netflix app while using WiFi and watch them later. 41. Find part-time work. One of the biggest challenges for me after I left my 9-5 job to travel full time was figuring out what to do with all that extra time. I started picking up photography and writing and with time I turned that into a part-time gig. Having new goals and accomplishments made me feel like I was working towards something that I loved again. 42. Pick up a hobby. 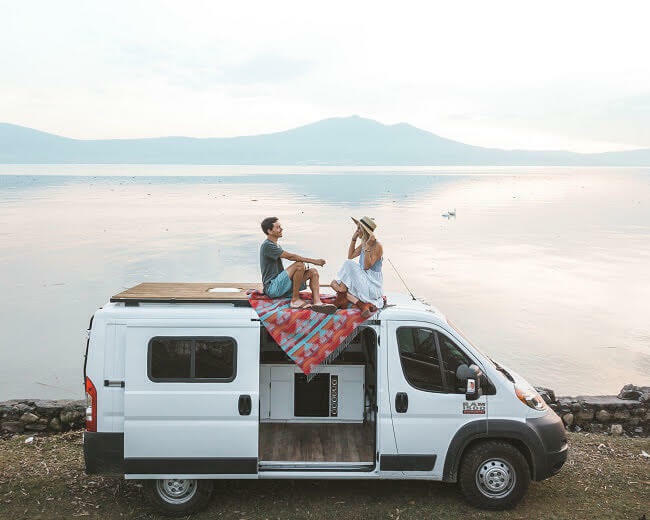 While traveling in a van you’ll have a lot more free time so it’s the perfect opportunity to try that hobby like painting or rock climbing that you’ve always dreamed of doing but never had the time for. 43. Make new friends. Traveling full time can get a bit lonely at times. Don’t be scared to grab a beer and meet new friends around your campsite. Most travelers we have met are usually stoked to meet other travelers. Sharing a small space with another person can be quite a challenge. Here are some tips for what you can do to keep yourself and your partner from driving each other crazy on the road. 44. It’s ok to ask for space. When you work full time you normally only see your spouse or partner in the evenings and on the weekends. But when you travel full time, you are in an environment where you spend EVERY. SINGLE. MOMENT. TOGETHER. It’s completely normal to want and need some personal space. Have a healthy and honest conversation with your partner establishing boundaries and make effort to create time for yourself. 45. Go for a walk. When things start heating up and you feel an argument coming, or you just need some alone time, go for a walk. Instead of getting into fights over things that you will probably regret later, it can be more helpful to go for a walk or a run, head to the market or read a book until you have time to gather your thoughts and let things cool off. Life on the road will throw all sorts of challenges your way. Here are a few tips to help you deal with those challenges. 46. Don’t sweat the small stuff. When things go wrong (which they will ALL the time), try to stay calm. In van life you will be put through stressful situations almost daily – your van will break down, the campsite you were counting will be closed, you’ll run out of water, gas etc… You will be faced with new challenges all the time but just know that you are not alone. Everyone living in a van has at some point dealt with a similar issue. Just about anything can be fixed and dealt with in a matter of time. 47. Ask for help. Whenever things go wrong, don’t be afraid to reach out to friends and other travelers to ask for help. In many cases, we use The PanAmerican Travelers Association Facebook group to seek answers from fellow travelers. With over 17K members, this group has been a great resource for us on the road. 48. Stay connected. Traveling in a van you’ll make new friends on the road but don’t forget to keep in touch with your friends and family at home, they will be the ones feeling your absence the most. We use WhatsApp, Instagram messages and Facebook to keep in touch with our loved ones. 49. Its ok to take a break from van life. When my husband and I first started living in our camper full time, we spent 8 months traveling in our van without a single break. After a while, it was starting to get pretty draining for us and all the excitement we first felt was beginning to evaporate. Now every few months we rent a room or Airbnb to take a break and enjoy the “normal” things every once in a while. 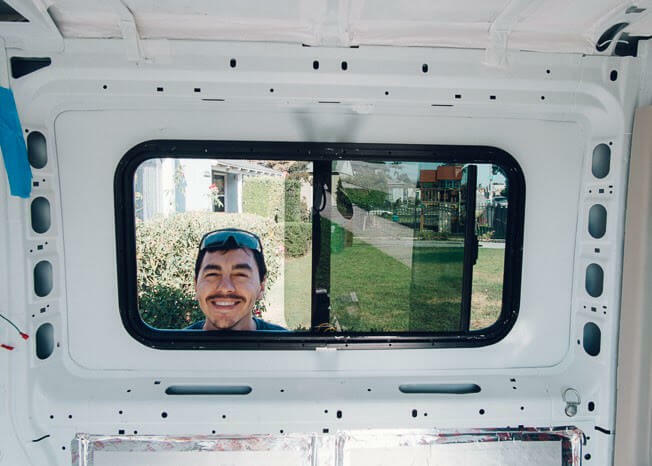 When we feel rested and refreshed enough, we jump back into vanlife with new enthusiasm. 50. Take a deep breath and tell yourself that it will be ok. Because it really will be. 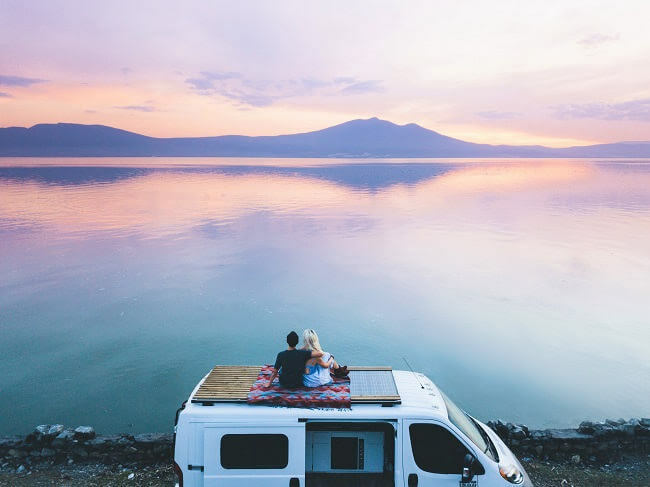 In the past year traveling in our van we have been faced with just about every possible challenge and although at the moment it always feels super stressful, at the end of the day it will always be ok.
Ready to dive into van life? Check out our guide on how to build your own campervan for less than 3K! Have you already tried van life? Leave us a comment below with your tips to rocking life on the road!